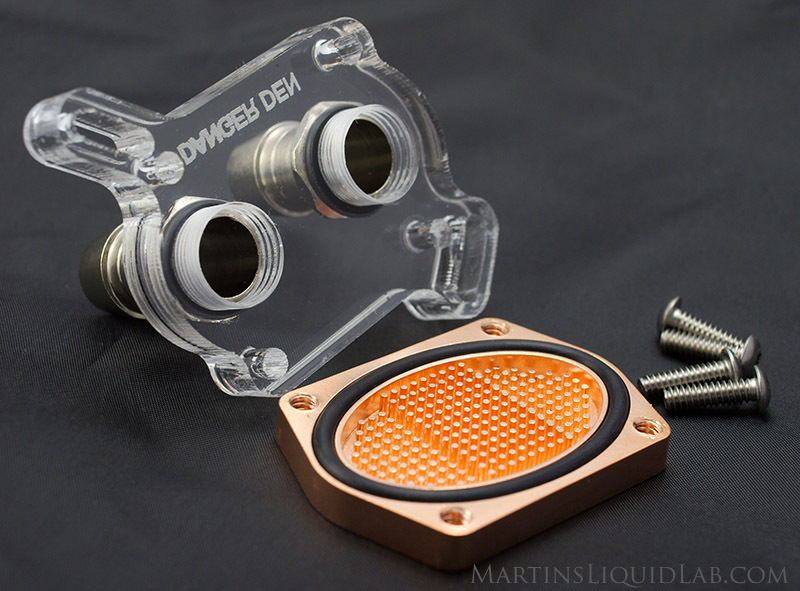 Welcome to my review of the latest in chipset water cooling. With motherboard chipsets becoming ever increasingly stressed, you'll noticed an increased emphasis by manufacturers to incorporate stronger and more robust heat-pipe type coolers to keep these components in check thermally. 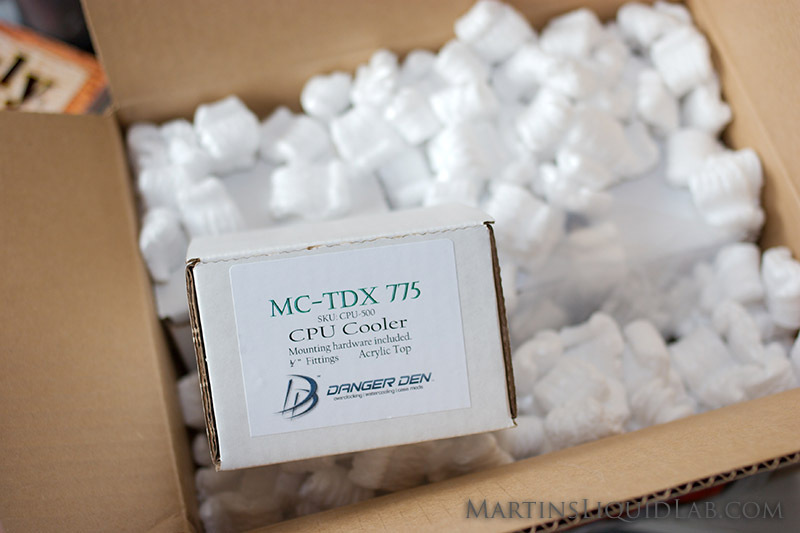 These coolers generally rely on secondary active cooling provided by the CPU fan on a stock or other driven fan cooler. 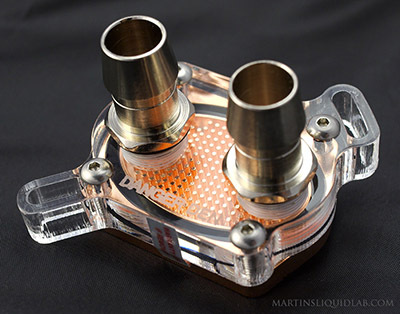 Unfortunately the negative result of water cooling the processor often times leaves an over-clocker with less than adequate air flow over these components making them more passive cooling solutions and possible bottlenecks. 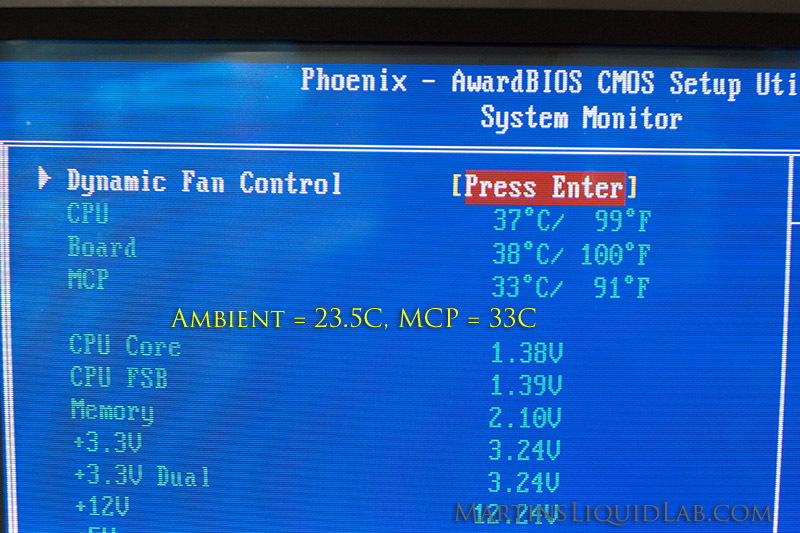 One option to counteract this is using a small and high rpm (loud) fan that's part of the motherboard package, a second is the option of using aftermarket air coolers, and the third option is water cooling those chipsets. 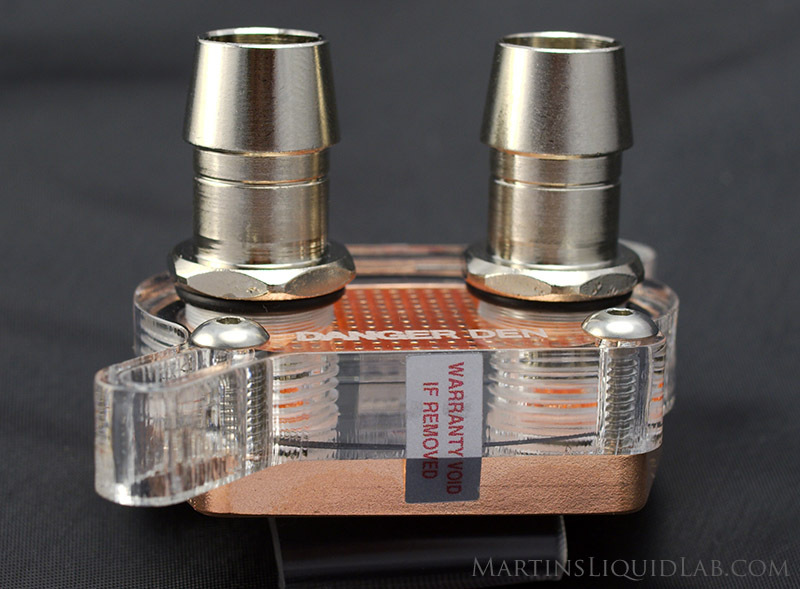 Most of the past water blocks for chipset cooling have nothing more than a flat slab of copper. 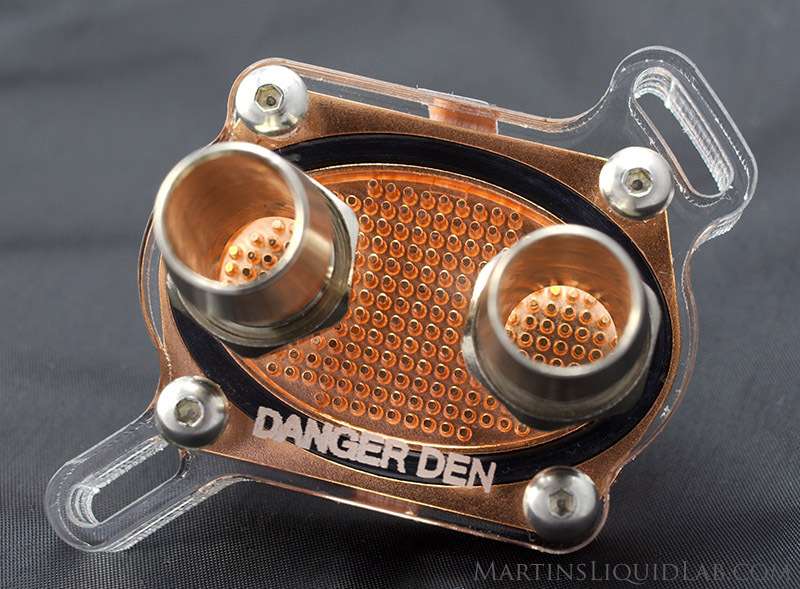 This is where this block stands out, Danger Den has provided us with a chipset block that utilizes more of a CPU micro-pin design to maximize surface area and heat transfer. Let's find out how this block performs both hydraulically and thermally. 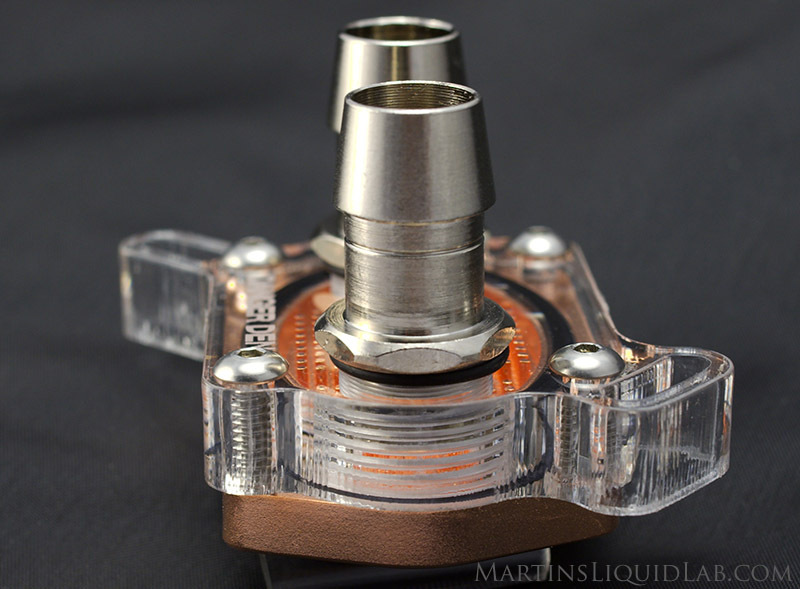 The MPC-Universal is aimed at providing chipset cooling for a wide range of motherboards. As noted in the specifications the hole spacing compatibility is from 2.10" to 2.43" (53.3mm to 61.7mm), but it is up to the user to ensure there is compatibility with their application. 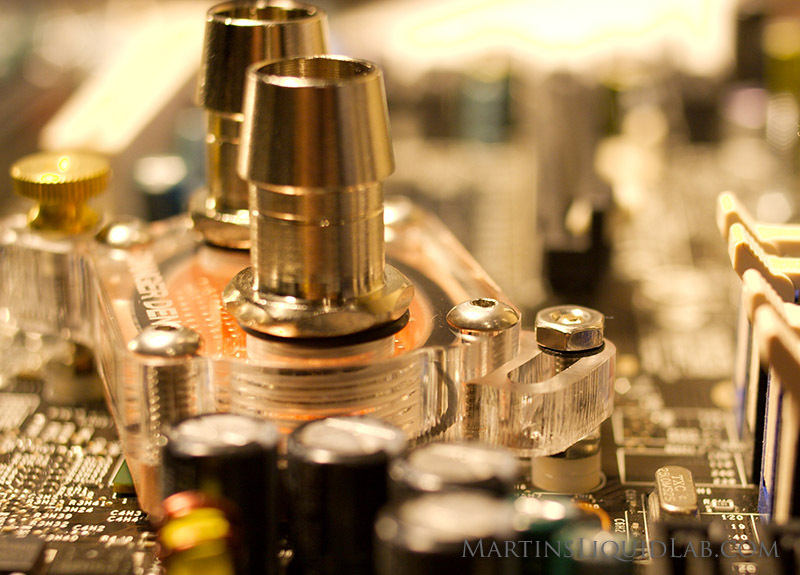 It's not uncommon for a user to have to make a slight modification to fit their motherboard. 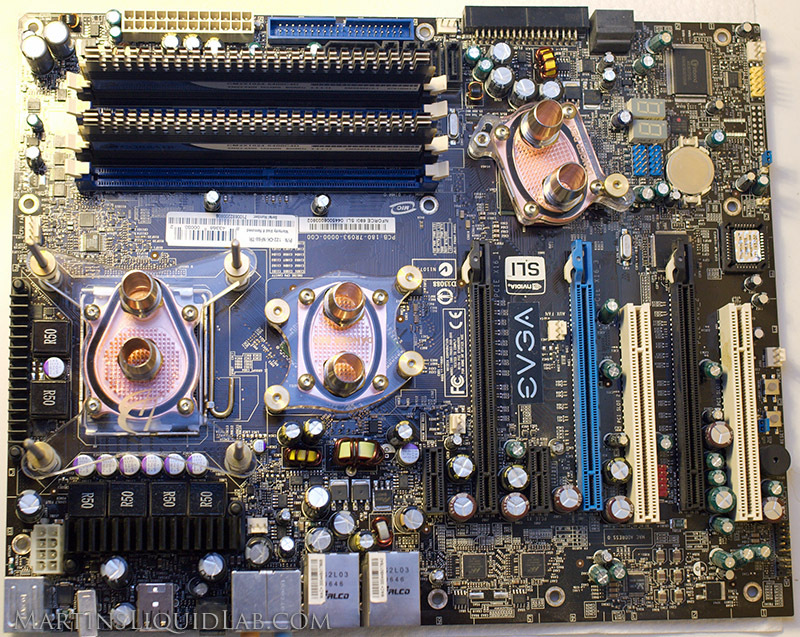 In my case with an EVGA 680i, there is not a chipset block made for the southbridge that doesn't require some modification, unfortunately the problematic 680i continues to be a not so compatible board with this block as well, but it can be with a little work depending on your setup. On to this new chipset block review! One element of design that stands out for this chipset block is it's massive amount of heat transfer surface area due to the micro pin design. Heat transfer between your coolant and the water block occurs at the surface of the blocks base. 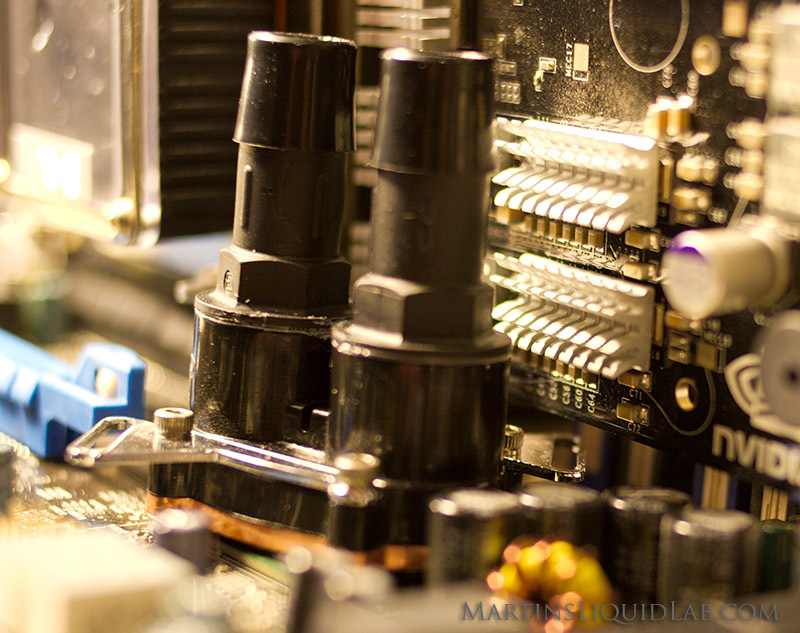 For a simplistic comparison, I'll compare surface area that comes in contact with the coolant. 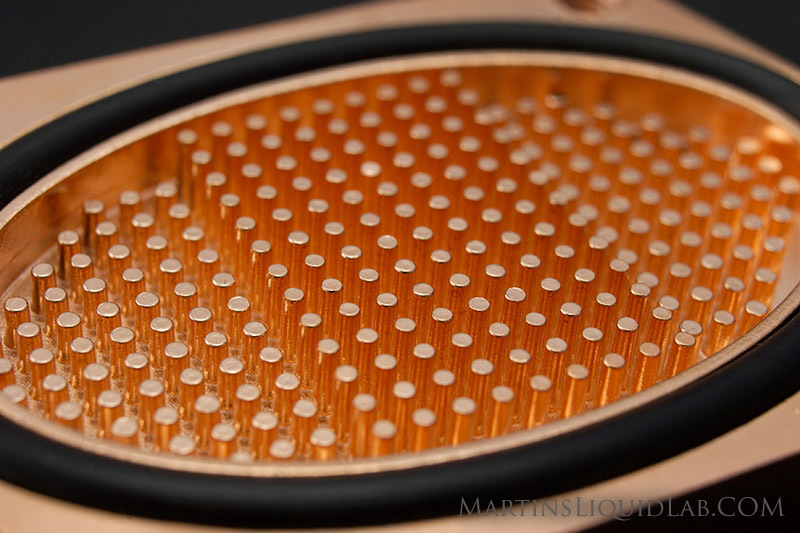 Below are measurements taken of this block's copper base to determine that contact area. Above I have several areas highlighted with corresponding areas by color. 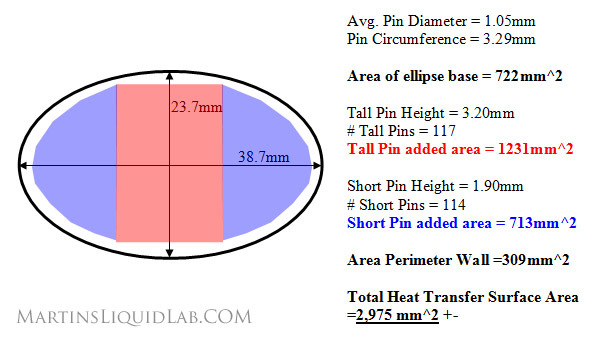 If the chipset base was purely flat, the surface area would have only been 722 square millimeters, but because of the pins added and dished base, that number become approximately 2,975 square millimeters. OVER 4X THE SURFACE AREA OF A FLAT BASE! In addition, the micro-pin design will improve velocities within the block. The principal is similar to a venturi on a carburator. Flow rate is fixed around a system so for an reduced cross section, the fluid has to travel faster to maintain that same flow rate. In additiona all of the rounded pins will create more mixing and turbulence as the water molecules bounce around and through the base. In the end this means better heat transfer. The base is very finely cast from C110 copper and having seen some casting problems in past on other blocks, I was pleasantly suprise that I could not find any. These pins are very nearly reaching the limits of how small copper pins can be cast, and they are done so perfectly in my sample. The base bottom is very adequate in finish, you can see by the photo above in the gallery how it is a nicely finished base nearly a mirror in reflection and a straightedge test proved flatness to be excellent. It's fairly common knowledge that lapping a base much beyond 1000 grit no longer yields additional performance gains, so the specified 1200 grit is more than adequate. The top is fabricated of 3/8" (9.3mm) thickness acrylic sheet and is very precisely CNC machined and the edges are nicely finished. Some folks may not prefer the use of Acrylic (Lucite) due to durability concerns. I don't believe it to be an issue on this block because of the proper design techniques used. Regardless for you all metal block-heads out there, Danger Den has produced the same top in a brass option for you to choose from! The barbs are nickel plated brass, (no flimsy cheap plastic barbs here!). Using my digital calipers the inside diameter is a heavy 10.15mm, that's as bored out as it gets for G1/4 threading. The barbs have all been installed and the block pressure tested at 85psi, so no worries about leaks, you shouldn't have to touch these barbs, they come preinstalled and pressure tested. On some of my other blocks that came with plastic barbs, I had a hard time getting tubing back off of them and getting tubing onto them without the barbs turning on me, brass barbs don't have that problem. The most scientific way to determine a blocks hydraulic resistance is to test pressure drop. Pressure drop is as it sounds, it's the measurement of pressure difference or friction across a block. In water cooling we have a specific amount of energy that our pump can produce, and it produces that energy in two primary forms. One is flow rate (which is constant throughout a water cooling loop), and the second in pressure energy which lowers as it encounters resistance until it reaches the pump again. This pressure energy is used up by resistance. 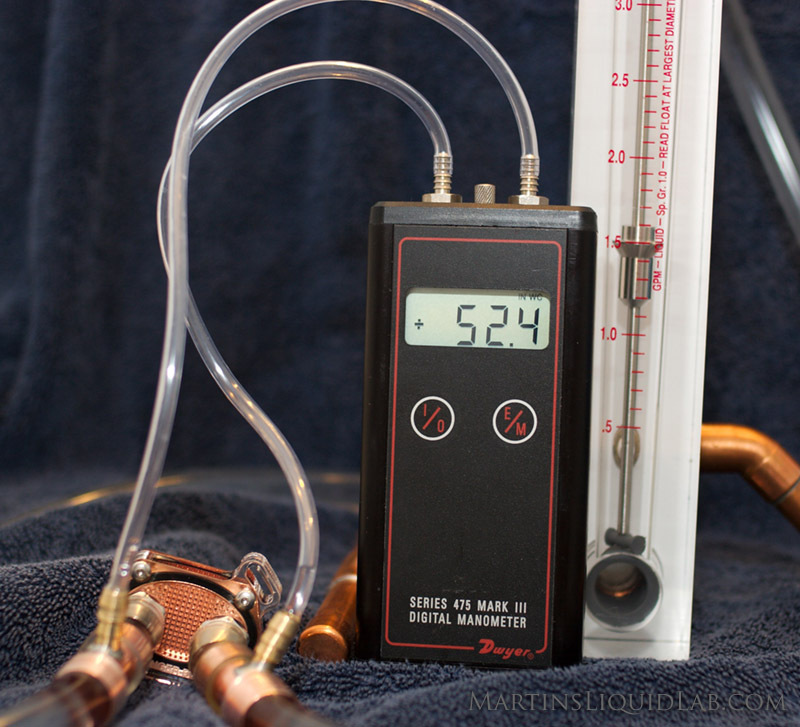 So pressure drop is really just a measurement of energy loss and this varies depending on the flow rate. To measure pressure drop, you need the ability to measure the pressure difference (Manometer), a flow rate meter, and a source of variable water pressure and flow. I typically log pressure delta and flow rate at .5GPM increments until I either max out my flow rate meter or digital manometer, this gives me a larger data set to create a more accurate trend-line in excel and spot any errors. 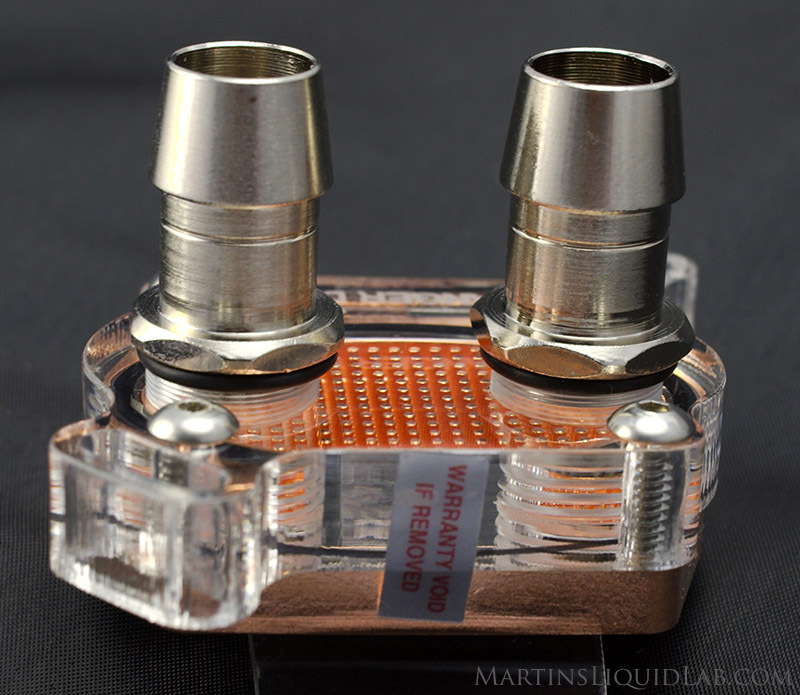 The pressure drop testing results were about typical of a round pin matrix style CPU block with one way flow, slightly less than most square or diamond pin type blocks. So, as expected, the increased surface area does create more restriction than a flat base, but as with any block design you tend to make trade offs between restriction and thermal performance. You need the surface area and increased velocities for good heat transfer, but you can't do that without some added restriction. The added heat transfer area will perform better thermally than a flat base, so the question is: What does this increased pressure drop mean for other blocks in the same loop? I'll try to answer than in this next section. So for a .15 GPM difference the C/W difference should be approximately .0005. 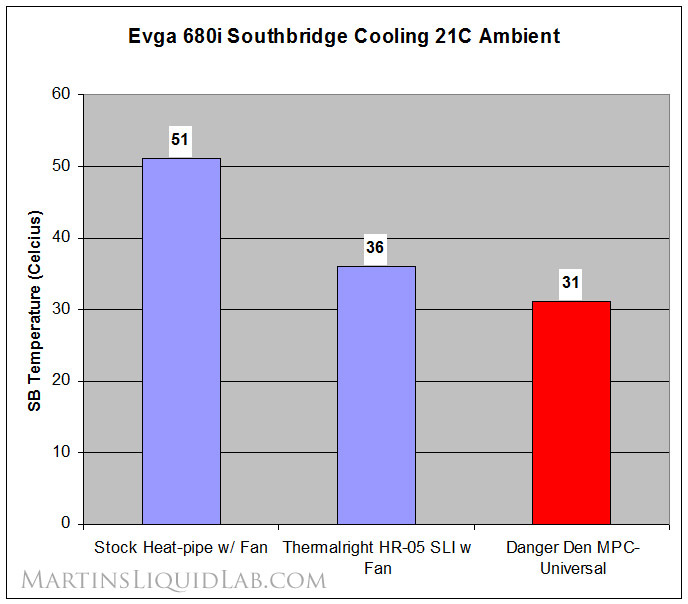 An E6600 C2D consumes approximately 109 watts when over-clocked to 3.3Ghz and 1.38 Vcore. Fuzion in same loop temperautre difference = .0005c/w X 109w = 0.05 degrees. Less than one tenth of one degree. I'm ignoring the radiator C/W for this rough estimation and reduced heat dump from the pump, but for general comparison I think it's fair to say, there is a negligible difference in temperature affects on other blocks. For most systems, you'll see several degrees better chipset cooling and flow rates will still be well within strong performing ranges. The installation on the 680i south-bridge required moderate modification to be compatible with my longer than typical 8800 GTX and 680i. It turns out the 680i is poorly designed to accomodate universal chipset cooling and was in conflict with both this block and the spare MCW-30 I had on hand. The conflict lies with the block top mount height conflicting with the bottom of an 8800 GTX card and the top mounting bolt. It should also be noted that the barbs could also conflict with a double slot VGA card solution or full coverage GPU block. The MPC-Universal requires both bolt shortening, and one more step of either countersinking a screw (easiest) or removing material off the mount to lower the mount hieght. Since I wanted to have the ability to remove the block from the motherboard while mounted to the case, I chose to remove material from the top of the block. There are a number of ways you could resolve the height conflict, but probably the easiest would be to use a 4-40 threaded round head screw and a small drill press to countersink the bolt head flush. You could use a combination of Dremel bits and a file to remove material down similar to what I have done. 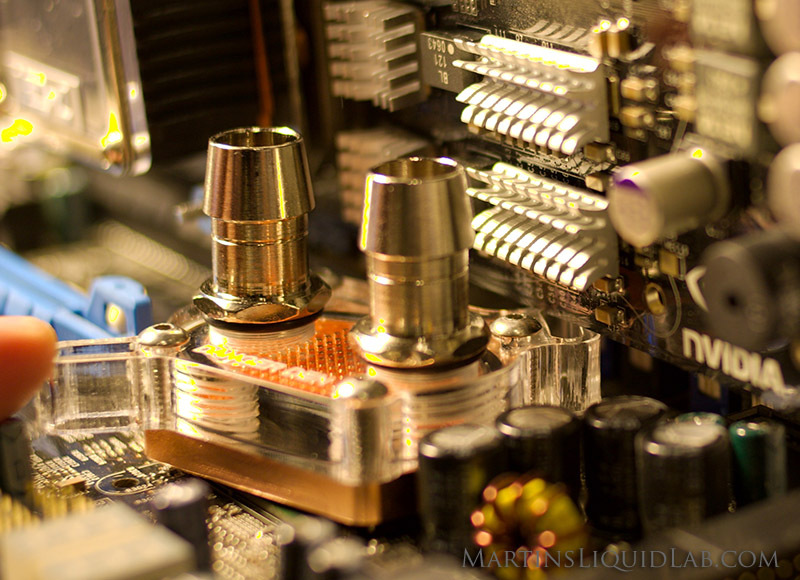 No matter what block, it appears the 680i's top mounting hole continues to provide a bit of a challenge for water-coolers, so expect a little modification work to make this block fit on an Evga 680i southbridge. After completing the block modification, installation was very straight forward. 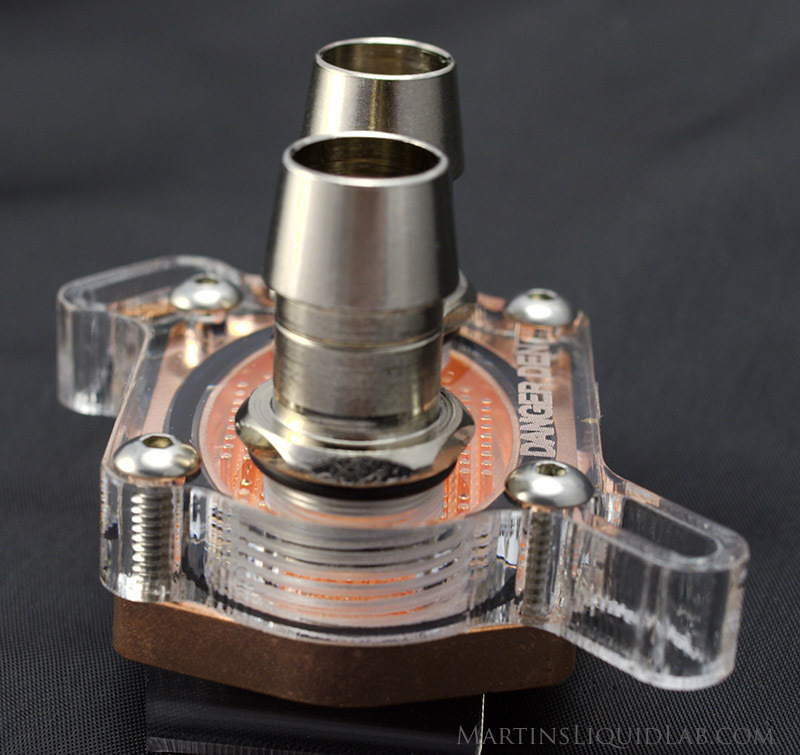 Considering the block comes fully assembled, you just need to assemble the mounting hardware and the rest is done. A 20 degree improvement over the stock heat-pipe cooler, and improvements over my very large Thermalright HR-05 plus with 80mm fan. all that surface area and water cooling does make a difference! Thermal Performance 10+ A significant step above all the rest, 10+! The MCP-Universal is a fantastic block design that is unparalleled in thermal performance. The micro pin matrix design common to CPU blocks provides over FOUR TIMES the amount of heat transfer surface area that a similar flat based chipset block will provide. 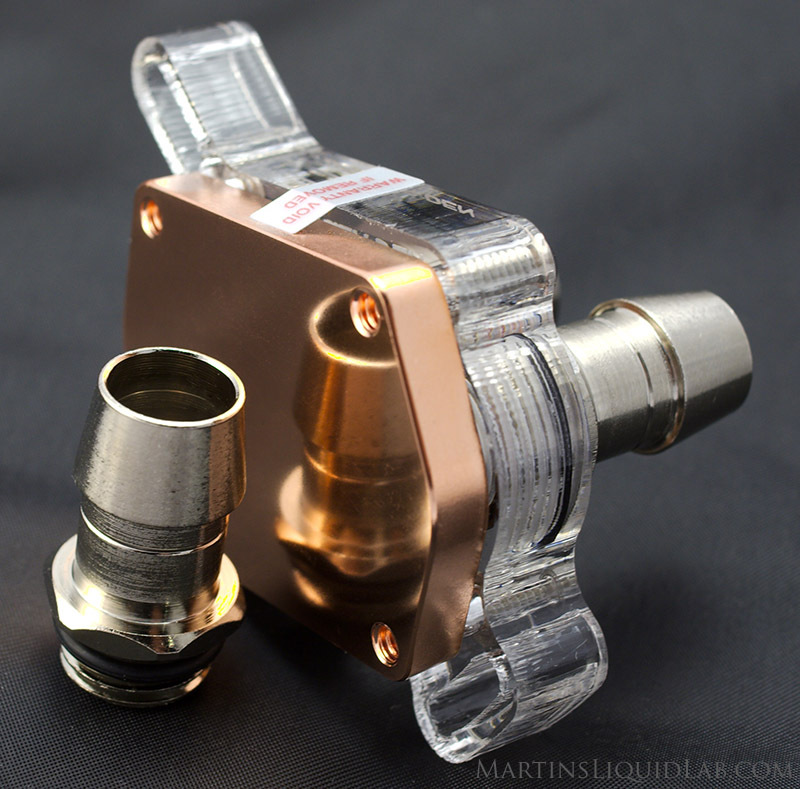 It provides an extreme solution to chipset cooling and it has permanently found a happy home in my water cooling system replacing my previous air cooled solution. Highly recommended!